The PD-4004 Security Gateway Appliance can be configured as a firewall, LAN or WAN router, VPN appliance, DHCP Server, DNS Server, and IDS/IP with optional packages to deliver a high performance, high throughput front-line security architecture at an excellent price in a compact footprint. 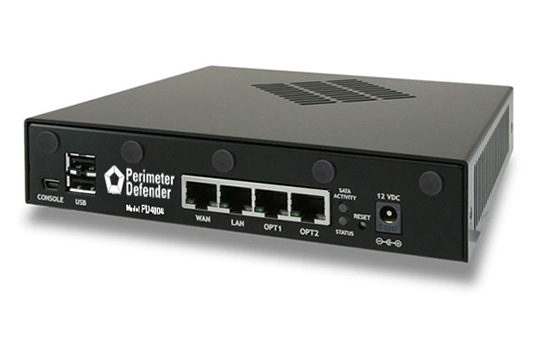 With preloaded Perimeter Defender software, the PD-4004 is a fast networking security solution unencumbered by traditional annual contracts, licensing fees, or artificial limitations. Connect via encrypted Virtual Private Networks (VPN) between your offices, let mobile workers connect securely, or connect to the Cloud!